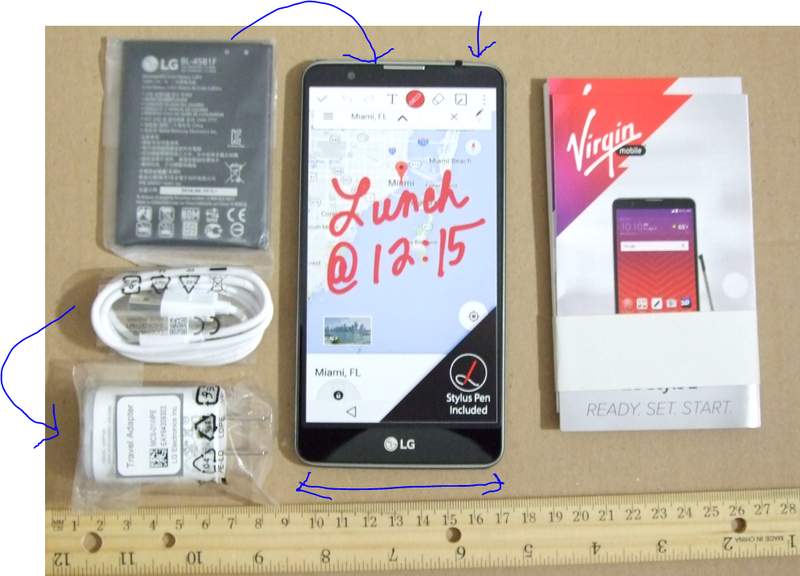 The new condition LG Stylo 2, without contractual requirements but locked to the prepair carrier it comes co-branded with, is on sale for $75 with free shipping by NewEgg actual in your choice of Boost Mobile or Virgin Mobile. Limit three of each per customer. They also have a bundle for the Virgin Mobile unit bundled with a power bank (Powerocks Cirrus). Virgin Mobile is not accepting new non-iPhone customers, but existing customers can still buy new phones and replace their existing ones. 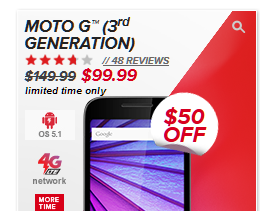 There’s even a secret place to buy Android phones at the Virgin Mobile USA website for existing customers. I have two posts on the Stylo 2 with more in the works: the Unboxing (only text and pictures, nothing annoying or noise-making), and a walk-through on how to deal with the pestering activation menus (if you don’t plan to activate it for cellular service). Existing Customers only: Virgin Mobile USA Android phones are still available for purchase! If you are an existing Virgin Mobile USA customer, you can still buy Android phones! There are a dozen Android phones still available for purchase through the Virgin Mobile website, with prices ranging from $30 (LG K3) to $650 (Galaxy S8). A number of them are on sale. As far as deal hunting, this is something you can keep an eye out for when they have the “fire sale” where you can get good deals. We have a very detailed post on how to do this, which includes the list of currently available Android phones and prices. You used to be able to buy phones at the Virgin Mobile USA website using your available balance, but they changed that a few months ago. You can still do it, but you have to call their customer services and buy through them. Expect some waits. I did this when I bought the LG Stylo 2. Some phones are excluded from “pay with balance”, such as the iPhones and select Galaxy models. If you want to get a more powerful iPhone without breaking the bank, $200 will get you a pre-owned 16GB iPhone 6 PLUS smartphone, with free shipping at Virgin Mobile. 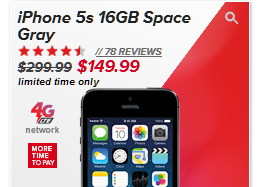 This is locked to Virgin Mobile, so you can’t use it on GSM networks or Verizon. I don’t know if it can be used on other Sprint networks. This is available in three color options, and there is a limit of two per customers. While with some Android phones you can pay with an account balance, for iPhones, Virgin Mobile won’t let you pay with an account balance. You have to use “fresh money”, eg credit or debit card or PAYPAL. Per the listing, you get a 90-day warranty on the used phones. If you are a Virgin Mobile USA fan, and want to get the new iPhone 7s, you may want to “camp” on their website. They have listed the new iPhone 7 models, with prices starting at $550 for the iPhone 7, and $670 for the iPhone 7 Plus. There is a limit of two per customer, and as of posting time, they are both out of stock. The prices above are for the 32GB entry-point models. The rest of the storage-options follow the typically Apple prices, you go +$100 for every storage jump. So the 32GB to 128GB jump (there’s no more 64GB; which should have been the entry-point considering the prices but I’m digressing) is +$100, and the jump from 128GB to 256GB is another +$100. The price jumps are the same for the 7 and 7+. None of the iPhones (old or new) can be purchased with Virgin Mobile account balance. Neither can the Galaxy S-flagships, but most of the other phones they have can. The “account balance” option is no longer available on their website, so you have to call their toll-free number and order (if you want to use your account balance). This makes sense if you have build up a big account balance. I should preface this by saying that this is a phone with many trade-offs, so be sure to read up on the various reviews before buying it. Don’t buy it just because the price is low! If you are comfortable with its trade-offs, then it’s not a bad deal. For $90, you can get the new condition LG G Stylo prepaid (no contract) smartphone running in either the Boost or Virgin Mobile network, both of which are “living” on Sprint’s network. The sale is by a marketplace seller but the order is fulfilled by Amazon, so you get some extra protection by dealing with Amazon’s shipment facilities and customer service. You don’t have to sign up for any service with this phone, you can simply use it as a Wifi-only device. Size is not everything, just because it has a 5.7-inch screen it doesn’t mean it’s a flagship. It has only 1GB of RAM but comes with a built-in stylus, which is its main draw ~ eg if you want a note-taking type of a phone. If you like the idea, but you find this too under-powered, a second generation is rolling out, out of the gate going for twice as much (perhaps the sale price is not a coincidence). The brand new iPhone SE “small flagship” in the Apple line-up just showed up on the Virgin Mobile website for $300 for the 16GB version and $400 for the 64GB version. However, as of the time of writing this is marked “Out of stock”. It has/had a limit of two units per customer. Like all other iPhones, you have to pay with a credit card, you cannot use your Virgin Mobile account balance (some of the Galaxy flagships have the same restrictions but for the rest of the VM phones, you can use your account balance to buy them). As usual with VM, there is no contract, it is month to month, and for Apple devices, if you sign up for Auto Pay (they automatically charge your card on a monthly basis until you cancel), you get $5 off on your monthly total, every month as long as you have service with them (and Auto Pay active).